They didn't even change the name! FOLLY: Word on the street is that the supermarket downstairs and the restaurant upstairs did NOT have the same ownership as was thought. The supermarket gave the restaurant the boot, took over their space and started their own restaurant with the SAME name and some very similar menu items. NOSA: Well, there is a big difference. New Delis is SIGNIFICANTLY more expensive than Old Delis. FOLLY: We tried to visit last weekend but it was completely full and these new owners made the rookie mistake of taking out the bar stools that were used as a waiting area. NOSA: I don't think the new owners took it out, I think the management of old Delis took their chairs with them. All the furniture is brand new. The only thing left is the wine fridge. FOLLY: I meant design wise. They still have a bar but opted for no stools. I was really torn between having the Delis Club Sandwich or the breakfast. 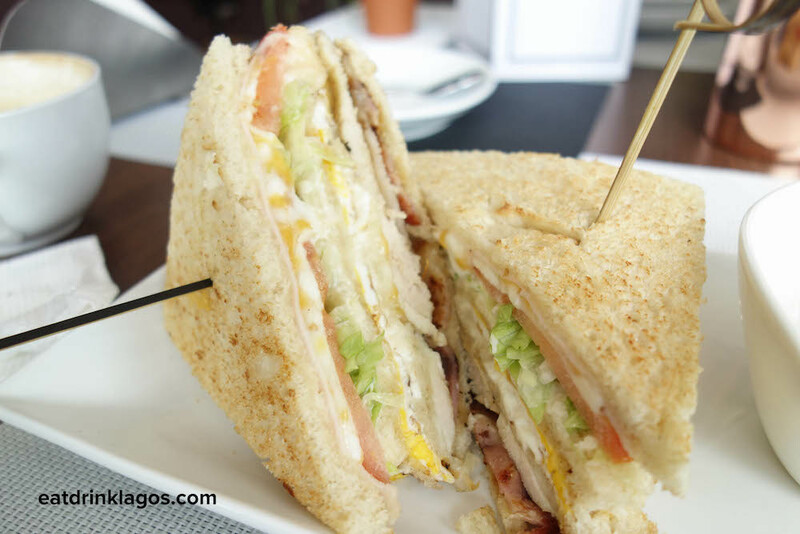 I eventually chose the club sandwich because I felt readers would be more interested in knowing how this tasted because we're a club sandwich-loving nation. NOSA: Someone on Twitter said my sandwich from Coffee Plus was weak and I'm still hurt. 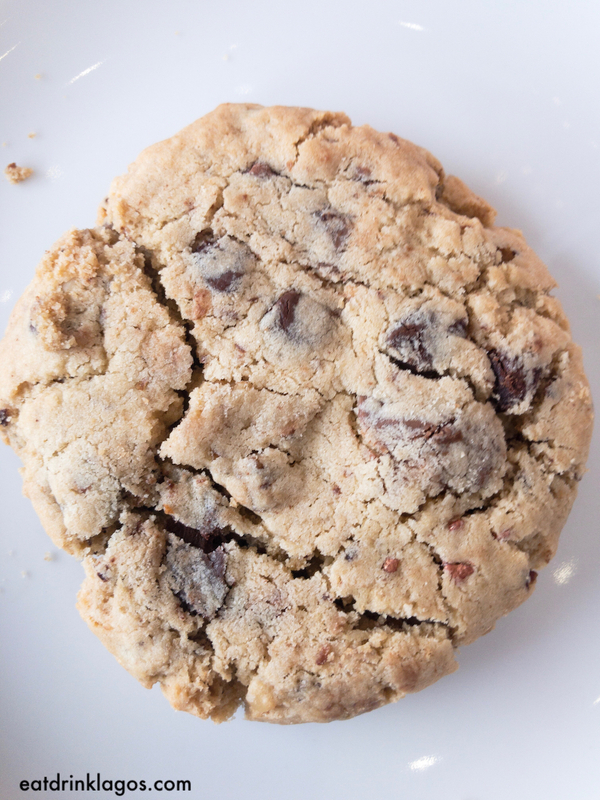 FOLLY: But first, Nosa and I were a hungry so he ordered a cookie from the jar on the bar. There is no way innocent Nosa and myself would have ever imagined that this humble cookie was ONE THOUSAND NINE HUNDRED NAIRA (N1900) for one single cookie. NOSA: I could've sworn the menu said N900. FOLLY: One thing you'd immediately notice when you order a sandwich at the new Delis is that the sandwiches here come with sides. NOSA: Old Delis gave you just a side salad, but also a considerably cheaper sandwich. FOLLY: Yeah, the wedges do not justify the ridiculous price tag. NOSA: Another thing is that they didn't keep the artisanal vibe that Old Delis gave their sandwiches. FOLLY: For some people, this is good because fewer calories and what not, but the sandwich needed more bread. Yes, more bread or at least thicker slices. The slices were much thinner than regular sliced bread and so, got mushy really fast and my sandwich began to disintegrate before I was done eating it. 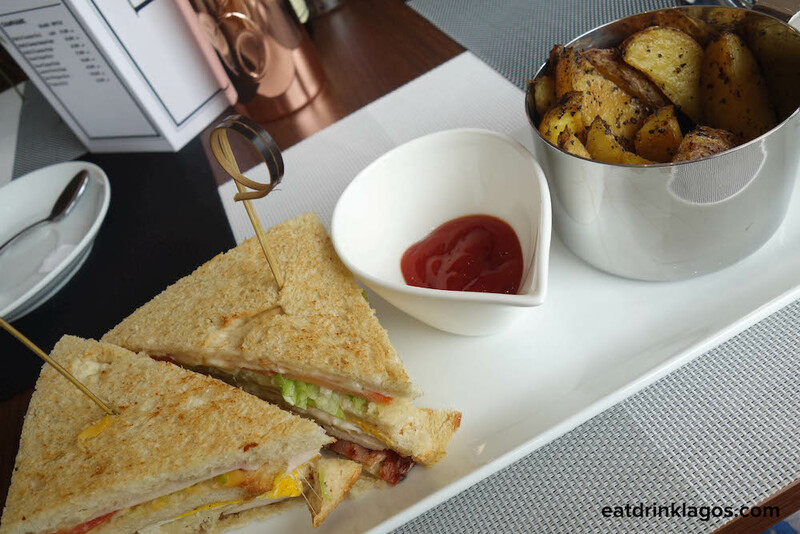 Another thing you'd notice that's different than most other club sandwiches that you'd order in Nigeria is that this uses fried eggs as opposed to boiled ones. I prefer this because the yolk can still be a bit soft. FOLLY: The moisture in the sandwich was too much especially since it came from three sources - the mozzarella cheese, tomatoes, and cheese spread. I could probably have done without the cheese spread. NOSA: For my main, I got the Prawn & Calamari Seafood Salad. I really wanted to get the salmon one like I did when we reviewed Old Delis, but I got greedy when I saw all manner of seafood listed in the seafood salad menu description. FOLLY: I also discouraged him because the salmon one was also all manner of too expensive. NOSA: In retrospect, I let my greed get the better of me. I really didn't need all that seafood. i should've just gone with the salmon one like a normal well-adjusted person. This doesn't mean the seafood salad was bad, but it was just so overwhelming at some point. By the time I tasted grapes on my third bite, I knew I had made a massive mistake. That said, it's actually a good salad if you're in the mood to be greedy. FOLLY: The dessert "window" is the first thing you see when you walk in (just like Crust & Cream). NOSA: I believe they call that thing a "showcase". FOLLY: Shrug. When Nosa went to fetch that cookie, he saw that they had sticky toffee pudding and I'm not one to have regrets so I had to try it. I asked for the ice cream to be served into another glass so Nosa could eat it but I still ended up topping the dessert with the ice cream for a photograph. This was perfect because it was as moist as sticky toffee pudding should be. I don't like seeing chunky dates so I was very happy that this didn't have any. NOSA: Sticky toffee pudding is not really my cup of tea, but this one was actually good. I wonder who handles their baking because I know, for sure, they don't do it. FOLLY: Way too expensive for me to form a Delis habit. I can't afford it and I'm looking forward to D-Cafe opening soon. Not a lot and if the supermarket downstairs is really busy, it will frustrate you.